Snapshot Editor allows you to capture your screens including multi-screen effortlessly. Annotate screenshot or images easily, choose from different shapes like line, arrow, rectangle, circle, free draw, text annotations or even pixelate effect. You can select an area, capture a selected window only, capture fullscreen or set a time for delay capturing. Making an eye-catching and stunning presentation and tutorial can be extremely easy. Add any text content using your favorite fonts and styles, apply shadow effects. Apply a mosaic to blur out a face, sensitive information, email address, phone number or anything you don't want to show with Mosaic overlay tool. 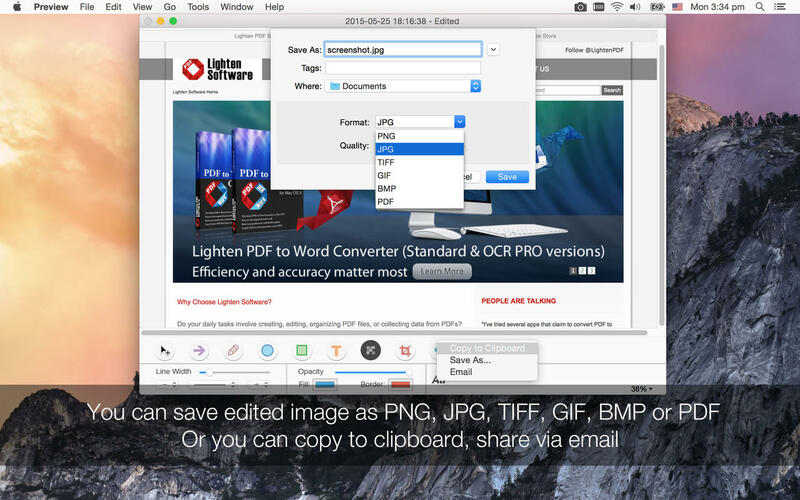 Snapshot editor allows adding or exporting of images in a variety of formats, including PNG, JPG, TIFF, GIF, BMP or PDF. Please feel free to contact our support team with any questions. If you enjoy using Snapshot Editor, please take a minute to leave a review, thank you very much for your support, it's really appreciated. 1. Added Retina screen and multi-monitor support, now you can capture screenshot from external monitors and retina screen without problems. 2. According to customers' feedback, you can hide icon from dock, start the app at login, adjust pixelate effect in Preference. 3. Optimized annotation speed, now faster than former version. 4. Multiple other UI optimizations and features added. 5. Fixed some bugs that cause the app crashes. If you enjoy using Snapshot Editor, please take a minute to leave a review, thank you very much for your support, it's really appreciated.